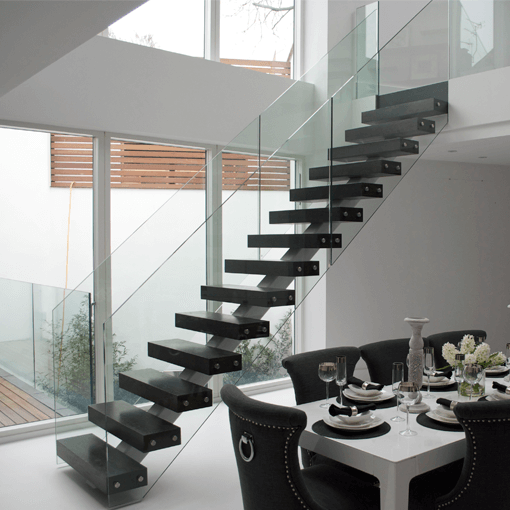 Middle spine staircase is a contemporary staircase solution, which is ideal for homes and offices. Its elegant look creates a dramatic visual effect that everyone strives for. The treads rest on one central stringer spine, which guarantees the solid feeling while climbing the stairs and, what is more, creates usable space under the stairway. Open risers let the light pass through, which brightens up the interior. For that reason, a central-spine stairway is often installed with light-looking balustrades, e.g., a transparent glass banister can emphasise the feeling of openness and add a clean touch to the staircase. Both the spine and the steps can be supplied in wood, steel or glass to provide an attractive contrast, and to suit the design you wish to create. At Exclusive Stairs, all middle spine staircases are finished to be remarkable pieces of art.